(Natural News) There’s trouble in pride paradise following the appointment of a new LGBTQ director at The Claremont Colleges in California, who apparently has a beef against other members of the LGBTQ community who are Caucasian. Dr. Jonathan Higgins, a black man who identifies as a homosexual, says he’s leery of other homosexuals who happen to be white, and doesn’t want anything to do with them. He also has a thing against “well meaning white women,” according to a “tweet” he posted to Twitter (that has since turned private), with whom he says he’s had negative experiences in the past. Higgins has been no stranger to controversy since he attained his position at the college consortium, having also tweeted his opinion that police only exist to “service and protect white supremacy.” He obviously has an ax to grind and isn’t afraid of shooting from the hip to express it, especially since he likely knows he’s protected by his own privilege as an LGBTQ person of color. Regardless, he’s drawing ire from many students who attend The Claremont Colleges, including other LGBTQ individuals who are deeply offended by his sentiments. One student, who also identifies as homosexual, told The College Fix that he has deep concerns about how Higgins will lead in his position if he’s so obviously prejudiced against a certain racial group. This same student also expressed outrage over Higgins’ sentiments against police officers, whom he says shouldn’t be broad-brushed as supposedly serving their roles from a position of racism. This student wasn’t alone in his concerns, as another white homosexual student told The College Fix on the condition of anonymity that he, too, doesn’t agree with Higgins. This individual went so far as to say that, despite his LGBTQ status, he believes that he would not be treated fairly by somebody like Higgins, who apparently feels enabled to express his racist views without shame. Higgins also, perhaps unsurprisingly, has issues with heterosexuals. 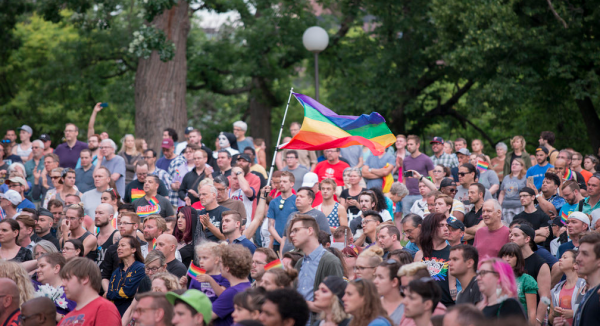 In expressing his views about designating a day to celebrate heterosexual pride, similar to “gay pride” events that occur regularly these days, Higgins was consumed with hatred. If the roles were reversed with a straight man making comments about how gay pride events exist only to celebrate “debauchery culture, heterophobia, and traditional family-phobia,” you can be sure that all hell would have broken loose – especially if this straight man was the head of campus group. But because Higgins hails from the protected LGBTQ class, the only flack he’s receiving is having his distasteful opinions highlighted mostly by alternative media outlets. He’s also receiving backlash from an anonymous transgender student at Claremont who told The College Fix that Higgins’ statements are deplorable.